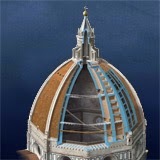 World Archeology: Mystery of Florence's Cathedral Dome May Be Solved. Mystery of Florence's Cathedral Dome May Be Solved. 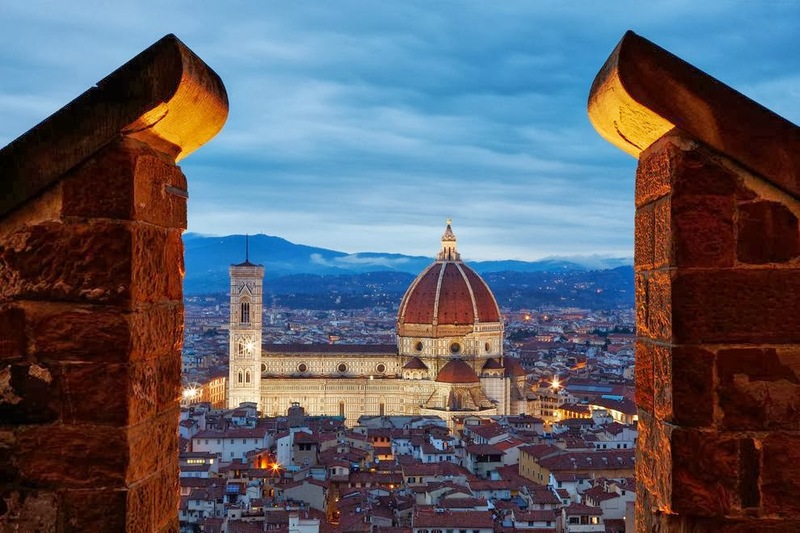 Nearly six centuries after it was completed, the dome of Santa Maria del Fiore cathedral in Florence—a cathedral known around the world simply as il Duomo—remains that city's icon and greatest pride. Built without flying buttresses or freestanding scaffolding, using experimental methods that many contemporaries believed would surely fail, the 150-foot-wide (46-meter-wide) dome effectively ignited the creative explosion known as the Renaissance. Brunelleschi's dome as on the day he was buried. The procession descended into the crypt to lay the wreaths on Brunelleschi's slab. A portly gentleman in his early 70s bent down and laid his hand on the marble, his head bowed reverently, his breathing audible. No one in history has devoted himself more wholeheartedly to Brunelleschi and his memory than this man, Massimo Ricci, an architect from an ancient Florentine family who walks at the head of this memorial procession each year. 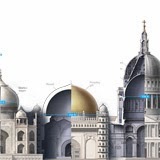 Ricci has spent much of his life trying to work out the construction techniques that Brunelleschi used to build the dome—still the largest masonry dome on Earth. Ricci's identification with Brunelleschi has been so intense that at times he says he almost feels the great architect standing, silent and invisible, beside him. "We've developed a special, almost spiritual relationship," Ricci says in his throaty growl. "Sometimes I'm filled with gratitude for what he accomplished, what he left us. Other times he frustrates me so much, I tell him to go to hell." Having Brunelleschi's spirit whisper in your ear may be about the only way to know for sure how he worked. Secretive to the end, he carried many mysteries of his dome to the grave. For 40 years, Ricci has tried to answer these questions in the same way that Brunelleschi did: by trial and error. He has built scale models of Brunelleschi's innovative cranes, hoists, and transport ships. He has scoured the interior and exterior of the dome for clues, mapping each iron fitting and unexplained stub of masonry and cross-referencing them against the archival documents concerning the dome's construction. And since 1989, in a park on the south bank of the Arno River half a mile downstream from Santa Maria del Fiore, he has been building a scale model of the dome that's 33 feet (10 meters) across at its base and consists of about 500,000 bricks. "Theoretical models are fine for grasping the dome's geometry," Ricci says, "but of limited use in understanding the problems Brunelleschi dealt with while building the dome. And that's what really matters to me: how Brunelleschi put bricks together." In the process of putting together half a million bricks, Ricci may have solved one of Brunelleschi's biggest secrets: how a web of fixed and mobile chains was used to position each brick, beam, and block so that the eight sides of the dome would arc toward the center at the same angle. Inspired by documentary references to "the star of the cupola," Ricci started by suspending a star-shaped hub in the center of his model dome. From the eight points of this star he stretched eight chains radiating outwards and downwards to the walls of his model, attached to hooks in the walls, in the corners of the octagonal plan (similar hooks are present in the dome itself). After last year's memorial procession ended, Ricci laid out for me some of the evidence for his theory of the dome's flower, which he considers to be the breakthrough in his conception of Brunelleschi's method. "In fact, Santa Maria del Fiore means Saint Mary of the Flower," Ricci notes. "And the symbol of Florence is a flower, the lily." He smiles with evident satisfaction. "You see? The pieces of my theory fit together, as solidly as the duomo itself."